Sleepy Hollow TV show on FOX: cancel or renew for season 4? Tonight marks the end of the third season of the Sleepy Hollow TV show on FOX and it very well may end up being the series finale as well. The show has been doing very poorly in the ratings and now, the producers have made a move that will likely infuriate more than a few loyal viewers. Should this Friday night show be cancelled or renewed for a fourth season? The series was a hit in its early days but those great ratings are long gone. This season, Sleepy Hollow premiered to a 0.98 rating in the 18-49 demographic with 3.36 million viewers. Compared to the third season debut, the debut was down by a whopping 51% in the demo and down by 38% in viewership. SPOILER AHEAD. The numbers got worse as the season progressed so the execs sent the series to Friday nights, likely hoping that the show’s loyal fans would follow and the ratings would stay at the same level. They looked stable for awhile but the numbers got even worse over the course of the rest of the season. The last couple episodes have attracted about a 0.65 rating with 2.6 million. 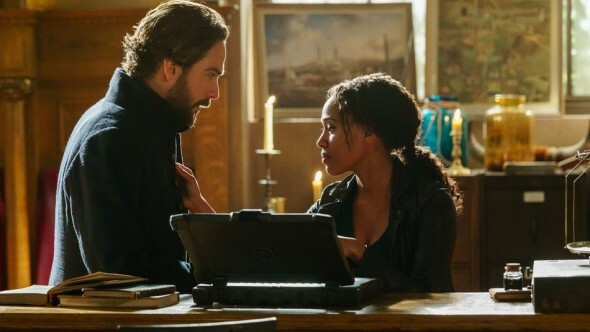 With such poor ratings, Sleepy Hollow, once again, is very much in danger of being cancelled. Now that one of the main characters has been killed off, should the series return? Should they bring Abbie back somehow or, is it okay that she’s gone? What do you think? The great thing about a show like this is they can bring her back an it would make sense. The bad thing is she does not want to come back and who can blame her they made it sound like she was the reason the ratings were bad. I was shocked of all the people she was the last one I would have killed off. They could have brought in new people and kept her but they chose to kill her off. I would like her to come back but if she does not I respect her decision. I am in love with the series. I’d be so devastated if it ends anything so. PLEASE! Bring back Abigail. What ever means. Really! It seems that people don’t have good tastes in horror series. Sad and dump. I stopped watching the show because of the killing of Abby. Crane and Abby are the two witnesses. They started with the show. That’s only reason I watch the show because of those two. I was a fan until abby died. Bring back abby or the show can get cancel. The show is now just a cartoon for the mentally challenged. Face it, S4 is just a last ditch effort to resurrect this lifeless mess. A season 5 is about as possible as Trump being elected for a second term. Fox is nuts to spend another nickel on this show. Bring it back like the show alot I watchit all the time.iwant to see where the rest of the show goes.tired of showes getting canceled.ilike to know where the next season goes what happens to them . Bring back sleepy hollow it’s a good show I watch it since it came our.ilove that show renew.it.dont cancel it.bring more season back.love watching it./I’d be upset if it get canceled….I want to know how the rest of it turns out. Bring her back. I’ll watch if she is brought back, otherwise I’m done.